I'm not really a gadget person. I not really jokingly tell the computer gurus at work that I'm a guinea pig for testing upgrades to our software. If I can't figure it out, you're in trouble because the average client isn't going to figure it out either. Do you really want 11,729 phone calls on this? But I found something I want. I come from a generation where photos and negatives documented life. Yes, I can scan the photos but the negatives. What to do with those other than stick them in a box and put off dealing with them for another year. The scanner function on my home printer isn't working right. The computer says it can't find it. 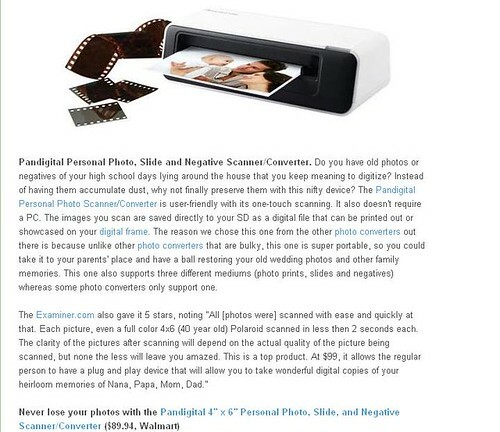 Even if it was working, it can't scan slides or negatives. This nifty little item seems to do it all. The only problem, aside from my not having $100 to get it, is that it's at Walmart. Sure, I would take an iPad or the new iPhone if offered, but I'm in serious gadget lust over this baby.